We love our re-designned Limited Edition tropical themed Children's Jungle Wall Stickers. 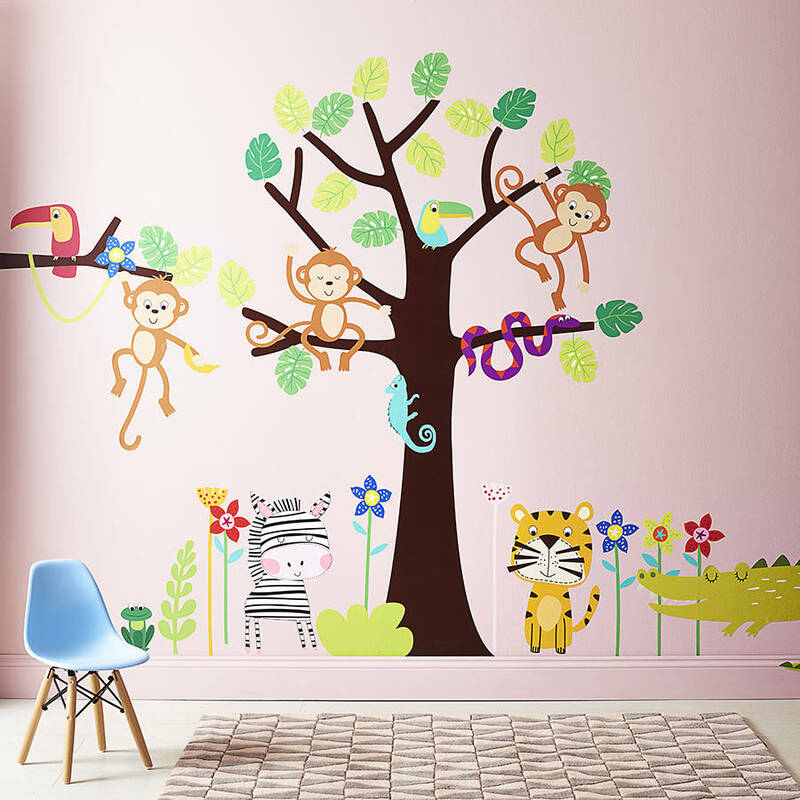 We know that you will be able to fill whole bedrooms with these jungle wall stickers. Either place as shown or as you wish as the animals and trees are all supplied separately. Our wall stickers are made from premium quality repositionable vinyl that is durable and child friendly. Available in two sizes, regualr or large and two colour schemes pastel or bright. 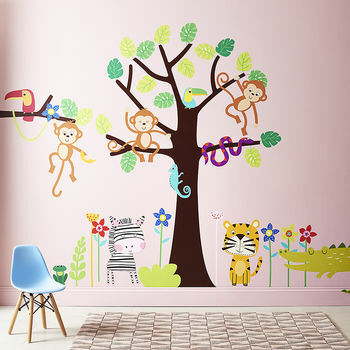 Our re-designed Children's Jungle Wall Sticker will easily fill any size bedroom or playroom and is so easy to install. Simply peel and stick. Bright and vibrant colours will enage your children's imagination and ensure they love their amazing new wall art. Precision cut from premium Phthalate Free, repositionable vinyl and printed using water based, fade and scratch resistant inks on our top of the range HP Latex printer. Our wall stickers do not contain solvents unlike other wall stickers so they are safe to use in hospitals, nurseries and children's bedrooms. Our wall stickers can easily be wiped clean with a damp cloth. Also all the animals and tree are seperate so they can be placed where you wish, on different walls, mirrors even smooth furniture. All wall stickers shown in our photograph are included in this wall set. Precision cut from matt finish removable vinyl, perfect for modern interiors. Once applied your wall sticker will look like it has been painted onto the surface with no outlines or border. We use premium quality material that will practically last a life time when applied indoors. Fully repositionable so can be used again and again. Using the latest print technology we are able to produce virtually indestructable stickers without using solvent based inks. Using water based inks our wall stickers are used in hospitals and nurseries due to having no toxins whatsoever in the material or inks. Scratch proof, water proof, kid proof! Overall size may vary depending on the positioning of the individual parts. Each part of the sticker is separate and can be positioned however you like.